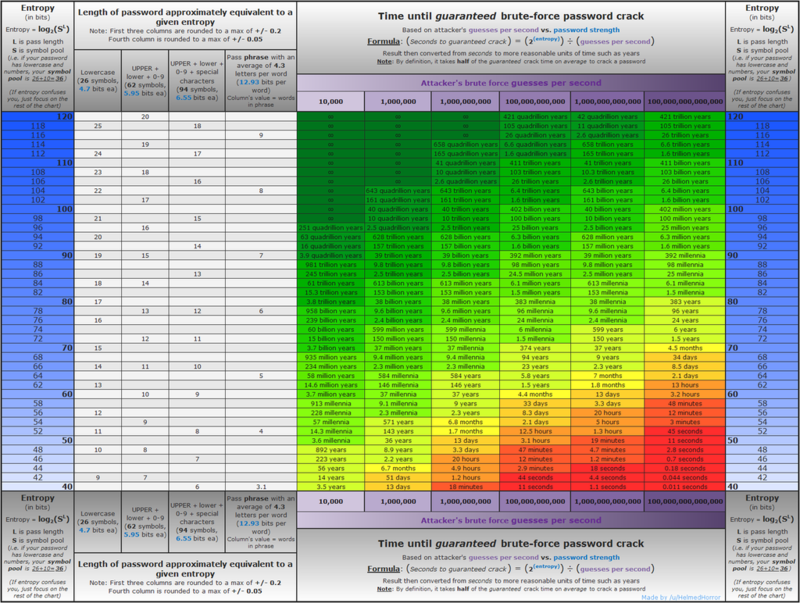 If an attacker knows your method of choosing a passphrase, your Entropy will be about 111 bits. Each word is worth about 15.82 bits of entropy (because 2^15.82 is about 57,850). So with seven words you have a passphrase with about 111 bits of entropy (15.82 x 7 = ~111). This would still take up to 500 billion years (average 250 billion years) to crack at 100,000,000,000,000 (100 trillion) guesses per second. Replacing a few characters with upper case and special characters will dramatically improve the entropy even when an attacker knows what method you used. Just a quick update to avoid the slight risk of running out of random bytes. I decided a while back to allow ECC using the NIST's top secret allowed curve (ECDH secp384r1) which is supported by recent versions of Firefox making it lightning fast (as well as the strong RSA & DH params they also mandate rather than any other elliptic curve). I'm still waiting for chacha20 stream cypher support on Raspbian though. Interestingly, I'm still getting a huge amount of DHE rather than ECDHE traffic, which tends to go against the perceived wisdom of the Lets Encrypt community that DHE only tends to be used with insecure settings ( we have DHE-RSA-AES256-SHA probably for older versions of Firefox and DHE-RSA-AES256-GCM-SHA384, which together are more prevalent than ECDHE-RSA-AES256-GCM-SHA384 and are no less weaker). We're still A+ with 100% in all categories for SSLLabs, naturally! Q: The commercial world appears to be moving to elliptic curves. Why is NSA continuing to support older algorithms? A: NSA supports the use of NIST P-384 in NSS. In the original CNSSP-15 both RSA and Diffie-Hellman were included as legacy algorithms which were only to be used until replacement elliptic curve cryptography (ECC) equipment was available. Since that time NSA has come to appreciate that some of these legacy systems will be around for much longer than we had planned. Because of these legacy systems and because there is an eventual need to move to quantum resistant public key algorithms, NSA has decided that it may be more cost effective for some NSS to continue to use RSA and Diffie-Hellman with larger key sizes until the new quantum resistant public key algorithms are ready. The site has been accepted on the Chrome HSTS preload list and has been propagated to Edge, Firefox and IE. Only Tor has yet to be updated to preload the penfold.fr URL. Yay! The little Pi now has a letsencrypt TLS key with an "A+" rating from https://www.ssllabs.com/ so we're pretty secure in communicating the passphrase. Thanks to the Lets Encrypt people for the certificate and Ivan Ristic for SSL/TLS tips. I've also added HSTS and am waiting for the Chrome HSTS preload list to accept my site to further mitigate risk of your passphrase being intercepted. I'm using an internal array rather than an external database, to avoid having the passphrase words go over the internet in cleartext (the db was hosted separately). Next step is to put it on a Raspberry Pi at home and get a letsencrypt TLS key using a decent TLS setup for secure passphrase communications. I've hastily implemented this using PHP rand() and I have no idea how that affects entropy, but as my source list is 58000 words rather than the 7776 in Diceware there should be a one in, ooh, several gazillion chance of guessing it on average. See Micah Lee's article for real details on how that kind of thing works. Each word from the list is worth about 15.82 bits of entropy (because 2^15.82 is about 57,850). So if you choose seven words you’ll end up with a passphrase with about 111 bits of entropy (because 15.82 x 7 = ~111) assuming the PHP rand() function on the hosted OS is anywhere near optimal. Note: I'm not a web developer and have just hacked this together using a PHP template, so be gentle with me... I just thought this would be fun. Any constructive comments would be welcome on my Twitter account @PenfoldDavid . I don't allow you to enter your own numbers à la Diceware as I'd have to deal with all the smart alecs trying to fuzz it. If you're not accessing this via a secure connection (mainly because I haven't set it up properly yet) you're better off using Diceware, randomly sticking your finger into a dictionary or banging your keyboard with your head. Also, the database is hosted separately so the words are going over the internet in clear text. It's probably not wise to use this to encrypt a disk if you're a Five Eyes target. I'll rebuild it some time in a different language so that it can take a local array of all words rather than selecting the specific words from the DB. I'll probably restrict the words to 10 letters or less too, as some of these are pretty hard to remember.